While dozens of massage chairs have been developed since the first one debuted in 1986, today there are only four basic designs that have survived the intense competition of the marketplace. 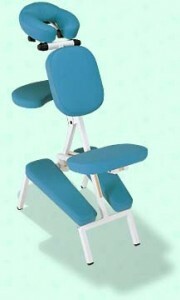 What distinguishes each design is the unique metal frame to which all of the other cushioned parts that support the face, arms, knees and seat attach. 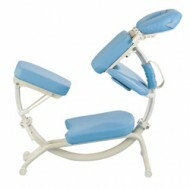 Designing and building a massage chair is far more complicated than creating a massage table. Massage chairs have four surfaces on four different planes that need to fit to the customer’s face, chest, shins and seat, rather than the one surface required for a massage table. Each surface must be adjustable enough to accommodate a wide range of lengths and weights and the chair itself should be adjustable for tall and short practitioners. 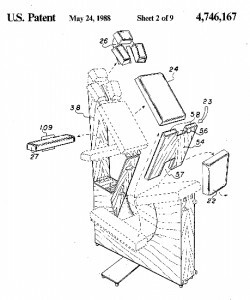 Add to that the requirement that the chair must fold into a transportable package that is lighter and smaller than the typical massage table and you end up with a major engineering challenge. In the spirit of acknowledging, for the first time, the unsung innovators of chair massage development, I will categorize each frame by name of its designer in descending order of popularity. Scott Beyer is the consummate tinkerer. In 1987, he attended a seminar I taught in Dallas where he saw the original massage chair-in-a-box I had developed with Living Earth Crafts. The next year Scott moved to San Francisco and began developing what has become the most popular massage chair design in the world. The reason for its popularity is the simplicity of the design, which made it relatively easy to manufacture and eventually, easy to copy. Scott sold his design to a manufacturer in Montana called Golden Ratio which named the chair the QuickLite. Golden Ratio neglected to get any patent protection and by the mid 1990s multiple versions were being made throughout North America, Europe and Australia. Golden Ratio went out of business about ten years ago, giving imitators even more leeway to copy the design. Today, with the advent of Chinese manufacturing, this design totally owns the sub-$200 massage chair market. Even the major manufacturers of the best massage chairs sell versions of this design as their low end or entry level chair. The primary selling points of the Beyer frame are its light weight (as little as 14 pounds) and its ease of adjustability, which is to say, it had very little adjustability and thus is very easy. 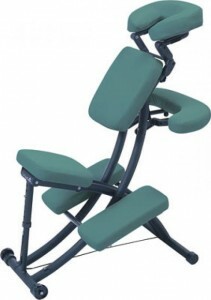 Some manufacturers have tried to add features that would increase the adjustability for the customer and/or practitioner but inevitably they also increased the chair weight. This design also has the shortest assembly and fold up time of any chair, about ten seconds each. Besides limited adjustability, the Beyer frame has another drawback. Its defining characteristic is a support beam that runs next to the crotch of the customer. While some customers may actually enjoy the extra “massage” it provides, the message it telegraphs to our unconscious parts is less than desirable for professional massage. There is one safety issue inherent in this frame design. A portion of the seat extends past the back legs of the chair, meaning if customers lower themselves to far back onto the seat, the whole chair will flip up into their face and they will land on the ground. A low price also sometimes means low manufacturing standards. Welds have been known to break on the cheaper chairs creating serious liability issues for practitioners. My best advice is to buy only from a reputable company with a good warranty. Unfortunately, Scott did not make a fortune off his creativity, but he deserves a top seat in the Massage Inventors Hall of Fame for his design. The second most popular chair design was created on the back of a paper napkin by Linda Riach and welded into reality by her engineering husband, Jeff. The Riachs are legendary in their own right as the founders, owners and current operators of Oakworks, a 35-year old massage manufacturing company. The Portal Pro chair that Linda sketched was defined by the unique cable system that linked the front and back leg braces providing an entirely new level of support and independent adjustability for the face, leg, shin and seat pads. While patent protection on their chair prevented exact duplicates, similar designs abound such as the Avila by EarthLite. Any time you see a chair that folds like an ironing board, you are looking at a relative of the Riach design. However, every feature has a trade off. The compromise with the cable adjustment system is that moving the cable up or down a notch changes the relative relationship between the seat, chest pad and knee rest, which requires a second and sometimes, third, adjustment. The Portal Pro weighs only 19 pounds and retails for $449 with a carry case included. After Living Earth Crafts stopped production of my original massage chair in the late 1990s, I began scouting for a new manufacturer to work with. At that time, Stronglite owners, John and Laney Lloyd, were developing a second-generation massage chair and invited my participation. While they were kind enough to give me co-design credit for the resulting chair, the truth is John had already come up with the basic frame design by the time I arrived on the scene. Since this article is defining chairs by their frames, it is the Lloyd name that goes on this design. The great innovation of the Lloyd frame was the elimination of any cabling holding the legs together. That meant that the seat height/angle and chest pad height/angle could be adjusted independently. In addition, the back legs can be raised or lowered for the height of the seat and comfort of the practitioners without changing any angles or requiring adjustments for the customer. Occasionally the Lloyd Frame has been copied, but its relative complexity has not made it an easy target for knock-off manufacturers. Also, like Oakworks, Stronglite has developed a robust international distribution network that has a vested interest in keeping a lid on copycats. The Lloyds sold their company to EarthLite a few years back, which also owns the Living Earth Craft brand. Michael Gillotti is a guy who knows how to think outside the box. His late 1990s design for a massage chair is still the most aesthetically pleasing chair on the market today. Michael was the founder and former owner of Pisces Productions, which he ran for over 30 years. His chair, the Dolphin II, is the only massage chair in this group still manufactured and assembled in the United States, but retailing at $525 (carry case extra), it has effectively priced itself into niche status. If the Riach Design was based on an “X,” the Gillotti Design was based on an “O.” The frame is built on three curved, nesting tubes that telescope in and out of each other allowing the chest pad and face cradle attached to one end to move from a totally horizontal to a totally vertical position. On the other end of the frame the seat can perform the same maneuver. One unique advantage of this design is that, unlike the other three frame designs, the Gillotti frame allows the customer to step into the chair from the side, making it easy for people who have difficulty raising their legs to sit down, e.g. if the customer has a range of motion limitation or is wearing a tight skirt. Structurally, the most glaring problem is lateral stability. With one long length of tubing and no struts supporting either end, the lateral flexion is unnerving for both the customer and the practitioner. Michael also wanted to create a massage chair that could also function as a table. Unfortunately, when adjusted for the prone position all of the weight of the customer goes into the chest or the shins and virtually none into the seat making it uncomfortable for more than a few minutes. As beautiful as it is, I have never seen a knock-off of the Gillotti design. All of the manufacturers keep tweaking the designs of their portable chairs, but it is unlikely that we will see any true innovation in frame design, such as the four described in this article. Where the real frontier exists is in designing stationary massage chairs. With the explosion of chair massage in retail settings, thanks to the current wave of mainland Chinese immigrant workers, there are now hundreds of fixed location chair massage studios where a stationary chair would be appropriate. When you remove the constrictions of weight and portability a whole new range of possibilities for comfort and functionality emerge. This entry was posted in Chair Massage, History and tagged chair massage, Dolphin II, ergo pro, Golden Ratio, Jeff Riach, John Lloyd, Linda Riach, massage chairs, Michael Gillotti, Oakworks, Pisces Productions, Portal Pro, Quicklite, Scott Beyer, stronglite. Bookmark the permalink. I have an idea for an improvement in a massage chair’s chest piece and leg pieces. I believe it would be a good addition to the future stationary massage chair. I’ve been a massage therapist for 30 years and a massage chair “lover” since 1995. Yes, just imagine what one could do with a bit of hydraulics on a stationary chair. I was shocked and disapointed by your reference to the bar on the Beyer chair frame being next to the crotch area and that some customers might enjoy the extra “massage” it provides. I have always thought you strived to bring professionalism to the massage industry and this comment just blew me away. It was not necessary to reference this bar in that manner. I agree with David, Scott Beyer definitely deserves to be moved in the top seats in the Hall of Fame for massage inventors, for his brilliamt design,, and was always interested in knowing all about the parts of the body, to relieve pain, stress, etc, and when he attended a seminar in Dallas, 1987, by David, it inspired him even more to design something that would be helpful for customers/patients who had different problems etc., again I take my hat off to Mr. Scott Beyer, I personalliy knew of his talents, and he demonstrated on myself and my wife, including , my family members. I agree with Mr. David, Mr. Scott Beyer, definitely deserves a top seat in the massage inventors Hall of Fame for his design, he was inspired in 1987, at Mr David’s seminar, in Dallas,1987, Mr Scott always had a drive to design something that would meet the requirements to help people to overcome their personal pains and stress, etc., for most or all customers/patients. He personally demonstrated on myself, my wife, and his and my family members in Castro Valley, CA., also Mr Scott’s wife taught messages and demonstrated her skills as well, I personally take my hat off to him as well. 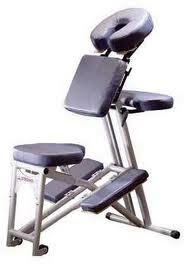 I had been a student of both David and Scott, and been practicing chair massage for 20 years now. Over the years, I used the “Great Frame Up”, the QuickLite, the wood StrongLite and the metal StrongLite . I had witnessed the metamorphosis of massage chairs and the improvements had been phenomenal for the client as well as the practitioner. Thank you for this article it made me appreciate my new chair even more, and I think the comment on the “other massage” from the chair bar was funny. I applaud Scott for the original chair the lightest chair ever. I just recently came across a wood living earth crafts massage chair that looks exactly like your wood model in the patent, and I was wondering how much it is worth now a days. I’ve tried finding it on google but they are all newer versions. Hi Danielle. I generally tell folks who have one of the original massage chairs to contact a local massage school to see if they would like to have one of the original chairs to show their students. Hello, my name is Miguel Acosta, i am from Bogota I am working in design a new concept of the chair massage, i have an idea so i would like to know how to be in contact with you.